ASNC attendees visit the UltraSPECT booth at this year’s event in September. horizon, and technical and policy developments. Primary areas of emphasis included the ASNC ImageGuide Registry, the growth of PET MPI, and challenges of the Tc-99m shortage. nuclear cardiologists can use imaging data for managing successful outcomes. With the ability to assess performance and develop the appropriate tools to improve nuclear cardiology labs, the field strives to focus on quality and safety. As the first national registry for non-invasive cardiac imaging, the operational framework offers various means to prepare for the Medicare Access and CHIP Reauthorization Act (MACRA) including: access to benchmark reports and standardized performance data, ways to enhance care and improve efficiency, and information on participation in regulatory programs such as how to avoid negative payment adjustments. Talk at the ASNC meeting highlighted the importance of participating for both individual practices and the field as a whole to elevate nuclear cardiology. However, there are only a few parameters relating to low-dose/safer imaging in the registry. Cardiac PET (positron emission tomography) - A shortage of Mo-99 is expected as Canadian Nuclear Laboratories shuts down its production. While domestic projects are underway to begin Mo-99 production, there will be a gap in availability. Experts at ASNC 2016 suggested using PET myocardial perfusion imaging – which uses rubidium-82 – as a possible alternative to SPECT given the upcoming radioisotope shortage. Not being dependent on a single imaging option, many cardiologists and radiologists elected cardiac PET to be their first choice among a growing range of alternatives to SPECT. However, PET is much more expensive to purchase and operate. Sever Tc-99m shortages - Tc-99, derived from Mo-99, was discussed at length at ASNC in connection with the shortage. The bottom line is that it is not a question of “if” a shortage will occur, but when it will hit, and how serious the implications will be. The concern is that a severe shortage will impact nuclear cardiology by year’s end, impacting the delivery of medical care in the U.S. and globally (see next feature). Ways to alter the use of imaging and lower radiopharmaceutical dose are key considerations for addressing this issue. 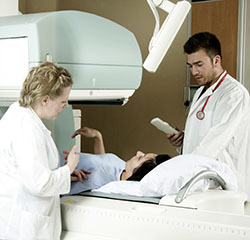 The nuclear medicine community is greatly concerned with the recent news that the supply chain changes of the radioisotopes Mo-99 and Tc-99m could lead to severe shortages and impact the delivery of medical care. All five reactors that generate Tc-99m’s parent isotope Mo-99 are more than 50 years old, and often experience shutdowns for maintenance and other issues. Most significantly, Canadian Nuclear Laboratories is halting its production this month, and we are all discussing strategies to handle the deficit. In 2011, the American Medical Isotope Act was passed to support production of Mo-99 and the development of alternative radioisotopes. The reality is, Mo-99 suppliers in the U.S. face significant technical, financial, regulatory, and market penetration challenges in bringing product to use. Long-term output of the current supply appears bleak, and rising costs of Mo-99 development paired with requests for low-enriched uranium make isotope price hikes imminent. The nuclear cardiology industry has become well aware that these price increases and the shortage itself will negatively impact care quality and procedure cost. It’s imperative, therefore, that we focus on solutions that will reduce our dependence on the uncertain future of radiopharmaceutical isotope production while still delivering optimal patient care. Some health systems are exploring the option of alternative cardiac imaging solutions, such as PET, a solution that uses rubidium-82. But PET is more expensive to purchase and operate, and often costs the patients more due to limited coverage by insurance providers. Adoption of cardiac PET “may be limited to very busy practices and academic research settings,” says Cardiovascular Business magazine. Health systems are also tapping into the latest SPECT technology to use a lower radioisotope dosage as well as shorten the length of exams. If reduction in the amount of injected dose could be achieved in a widespread manner, the amount of Tc-99m required would substantially decrease, thereby offsetting increases in unit dose prices by suppliers. Generator profiles at pharmacies would lower, enabling them to ration generators across sites, increase margins, and improve their ability to supply unit doses for rural areas. UltraSPECT, along with several pharmacy, service, and turnkey solution providers, has focused on reducing injected doses in recent years. Commitment to this goal translates to safer imaging in compliance with low-dose guidelines and delivery of a viable solution to cope with the very real Tc-99m shortage. Isotope shortages, fluctuations, uncertainties—they are more definitive than not. Today’s leaders in the delivery of smooth, safe patient care are freeing themselves from the binds nuclear medicine has succumbed to in the past, moving toward an independent, productive future.